Canadian Yachting was founded in September 1976 (Volume 1, Number 1) by publisher Gerald Kidd and under the editorship of Ron Joiner assisted by John Turnbull, working out of the Vancouver, B.C. offices of Pacific Yachting Magazine, although a Church Street, Toronto address was listed as their formal address, later headquarters. The first issue included an extensive preview of "Dockside 76" that was to be held in September of that year at Ontario Place, under the title "Dockside Boat Show Section." Canadian Yachting was published by McLean Hunter from December 1978 (V.3 no.12) up to 'Summer' 1990 (V.16 no.4, with an erroneous label suggesting V.17 [sic]), and, since September 1990 (V.16 no.5), has been published six times a year by Kerrwil Publications. 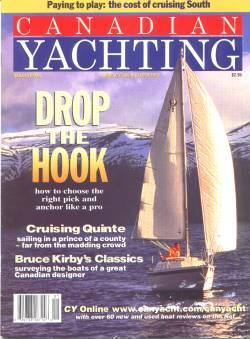 The "Sailpast 1996" issue illustrated here contains one of the first articles on the restoration of the sailing yacht CANADA and a write up on cruising Quinte - this Society's home waters. Our collection (253 issues) is incomplete; from the first issue September 1976 (V.1 no.1) to 2011, with just a very few thereafter up to 2015; donations would be greatly appreciated. We also hold numerous duplicates for exchange - please enquire. Indexing: by NMA is avalable here.